Much ink has been spilled in the last week or two over Bruce Bartlett and Andrew Sullivan and the whole crew of born-again fiscal conservatives who've finally seen the light that George Bush ain't no flippin' fiscal conservative. But at least one can still identify some economic conservatives, even if they are becoming increasingly marginalized and shut out of the party. What I'd much rather know is...wither social liberals? When's the last time you can recall seeing such an animal? Remember back in the old days, when liberals actually seemed to believe in things like privacy and autonomy and personal choice? But Massachusetts Democratic Rep. Barney Frank, the top Democrat on the House committee, opposed the bill. He said Congress should not seek to control how adults spend their money just because some lawmakers oppose gambling. "Adults are entitled to do with their money what they want to do," he said. WASHINGTON -- Two Northwest senators, Republican Gordon Smith of Oregon and Democrat Maria Cantwell of Washington, have introduced legislation to prohibit gasoline price gouging during national emergencies. Of course, last year in her role as co-chairwoman of Kerry's campaign in Washington, Cantwell had no problem charging $1000 for a meal at Seattle's Westin Hotel. (See: The Seattle Times.) Either meals at the Westin in Seattle are very, very costly, or Cantwell was raising prices far beyond costs. What's up there that we need? Oh, I'm with ya, brother. It's a long-term goal of mine (and my old TII boss David Theroux has claimed to be enthusiastic supporter of the idea) to write a lengthy tome that would hopefully serve as the definitive catalogue of everything that is repugnant about our federal space program. Sure, there's lots of wasteful government boondoggles out there, but none -- not even the John Cougar Mellancamp-inspired wails for the U.S.D.A. to keep doling out farm subsidies like so much slop for the piggies -- inspire the kind of wide-eyed, "Awww shucks" boosterism that supporters of NASA are apt to try to pass off as serious public policy analysis. 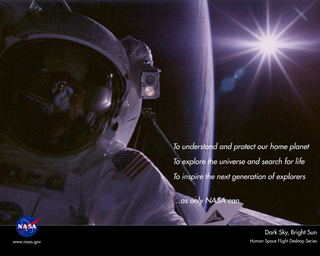 Given libertarians' collective inclination toward sci-fi geekery, all too many of them have a soft spot for NASA. They'll point to private initiatives to head to the stars, and make the weakly supported claim that such efforts would be legion, if only the government would get out of the way. But very few are willing to entertain the possibility that space exploration, itself, might just be an enormous waste of time and resources from the get-go. Having spent two years in the employ of that grand momma of corporate welfare queens -- the Lockheed Martin Corp. -- I feel it is my duty, as well as an earnest act of contrition for my past sins, to force my fellow libertopians to face that fact. If you look just at the city, rather than the Metro area, New Orleans is actually on a decades-long streak of negative population growth. All this while the South as a whole has benefitted from the most massive demographic shift in U.S. history, with millions abandoning the Snow-and-Rust Belt of the industrial Northeast and Midwest for the corporate parks and gated condominium developments of the SunBelt, which also notably includes Vegas and Arizona. What makes this especially strange, at first blush, is that New Orleans would seem to possess many of the qualities Yankees complain about missing in the New South. It is an historic city, with interesting architecture, and a diverse, international and cosmopolitan feel. Among Southern cities, only Miami can rival New Orleans for nightlife, or for the city's concentrations of Catholics and Jews. The city is also a culinary mecca, a literary haven, and arguably the central locus for all of American music. Yes, it's crime-ridden and a murder capital, but again...so is Miami. So what's been keeping folks away from the Big Easy? Perhaps it was a little of that corruption the place is so famous for (on full display in Katrina's aftermath), which has served to raise the cost of doing business in all sorts of completely unnecessary ways. But is Louisiana really as corrupt as all that? Haven't things gotten any better since the days of Huey Long? I point you to Exhibit A: If J. Robert Wooley doesn't end his current stint as the state's Insurance Commissioner by going to prison (which remains to be seen), he'll be breaking a tradition carried on by his three immediate predecessors, Sherman Bernard, Doug Green and Jim Brown. Ole Man Frist has set the (likely to fail) cloture vote on the estate tax as the second order of business when the Senate returns from their month-long respite, spent lazily wiling the days away making nosy, officious and dangerous intrusions into the smallest corners of life back in their home districts, rather than doing the same here in the Beltway. Wally Olson reminds us what's on tap as the first order of business. Personally, I find myself split three ways on the issue of Hawaii'an nationhood. The idealistic AnCap in me wants to find a silver lining in the notion of multiple orders of sovereignty competing for citizens within the same geographic zone, proceeding from the principle that extending choice is likely to spur both the Hawaii'an and plain old American governments to be more responsive. But the naive integrationist in me wishes that such a choice could be extended to all, and not just those who fit some arbitrary racial phenotype. And the pragmatic tax dodger in me realizes this really has nothing to do with either choice or race, but is instead primarily motivated by a desire to install a new South Pacific feeding trough at the Bureau of Indian Affairs.